In September, when Hyundai Motor heir apparent Chung Eui-sun was promoted from vice chairman to executive vice chairman, the group was still cautious about acknowledging him as the official new leader of the auto giant, which has been run by his father Chung Mong-koo for over the past two decades. But from next month, he is expected to take on more responsibility at the sprawling group of 56 companies, as a co-CEO of the group along with his 82-year-old father, who has not appeared in public for the past few years. With Chung, the only son of the group, taking the chief manager position, he is expected to put his leadership on full display as he is tasked with pulling the group through challenging market and trade conditions in the country and overseas. The company confirmed that the group’s board, consisting of four executives and five outside directors, will hold an annual shareholders meeting on March 22 to vote on the appointment of Chung as CEO. If approved -- which is almost certain -- the 49-year-old tycoon will become co-CEO along with his father Hyundai Motor Group Chairman Chung Mong-koo, President Lee Won-hee and Vice President Ha Eon-tae. 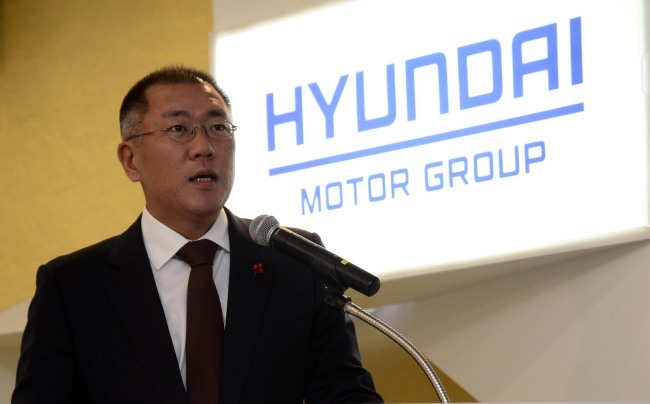 Chung Mong-koo also heads the group’s auto parts maker Hyundai Mobis. On the same day, Hyundai Mobis will hold a separate annual shareholders meeting to appoint Chung as CEO. The company said it will also add foreigners as board directors and appoint Albert Biermann, president and chief of its research and development division, as a new board member. Kia Motors, a sister company of the world’s fifth-biggest automaker, is expected to change Chung’s status on the board from nonstanding director to an inside director at the next shareholders meeting scheduled for March 15. “Since the executive vice chairman has stressed the importance of communication with shareholders, investors and the market, the group is likely to speed up its protection of shareholders’ rights and increase their value,” Hyundai Motor Group said in a statement. The third-generation chaebol scion is taking the helm of core affiliates 11 years after he stepped down as Kia Motors CEO, taking responsibility for Kia’s continued losses. With his renewed status at Kia Motors next month, Chung will take the chief position of the group’s four key units, which include Hyundai Motor, Hyundai Steel and Hyundai Mobis. While the group has denied that Chung’s appointment as CEO is an imminent sign of leadership succession, market experts viewed that it was widely expected after the group’s year-end executive reshuffle. “The group’s sweeping executive reshuffle last year already signaled a generational shift, making room for younger, foreign-trained recruits,” said an industry insider. Of the amount, some 14.7 trillion won will be used for future technology development, including autonomous driving. Some 6.4 trillion won will go to smart mobility such as vehicle sharing. Hyundai Motor Group has set the goal of achieving a 7 percent rate of operating profit and 9 percent return on equity rate by 2022. As of last year, the group’s ROE fell to as low as 1.9 percent. This year, with US hedge fund Elliott continuing to pressure Hyundai Motor Group, hurdles remain for Hyundai’s efforts to revamp its business management and recover flagging business. Last year, Elliott demanded the group to return its excess capital to shareholders and sell noncore assets, saying that the group owns excessive capital, citing a report by consultancy Conway MacKenzie. But the group said Tuesday that it has rejected demands by Elliott for a combined 7 trillion won ($6.3 billion) dividend payout. While Elliott is also pressuring the group to overhaul its ownership structure, experts say that Hyundai Motor Group will roll out a revised restructuring plan sooner or later and possibly put this to a vote at an extraordinary shareholders meeting in April or May. Hyundai Motor had said in a regulatory filing that the dividend proposed by Elliott would lead to a “massive cash outflow,” hurting future investments and shareholder value.